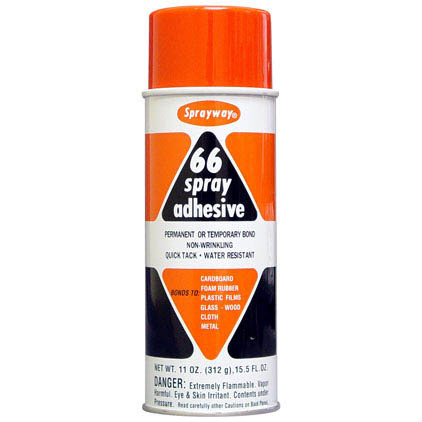 Sprayway 66/66c/366 is non-wrinkling, repositionable, water-resistant; a quick or long tack adhesive providing either a temporary or permanent bond. Sprayway 66/66c/366 is a high-performance spray adhesive product perfect for use in the screenprinting shop, sign shop, art studio, or graphic arts, and may be used to bond many materials including: metal, cardboard, foam rubber, plastic films, glass, wood, paper and cloth. It prevents paper patterns and stencils from shifting and is ideal for quick layouts, paste-ups, labeling and display assembly; for the art studio; print, picture framing, screen print, or signs/display shop; sewing trades personnel, woodworkers, and office and indstrial settings.